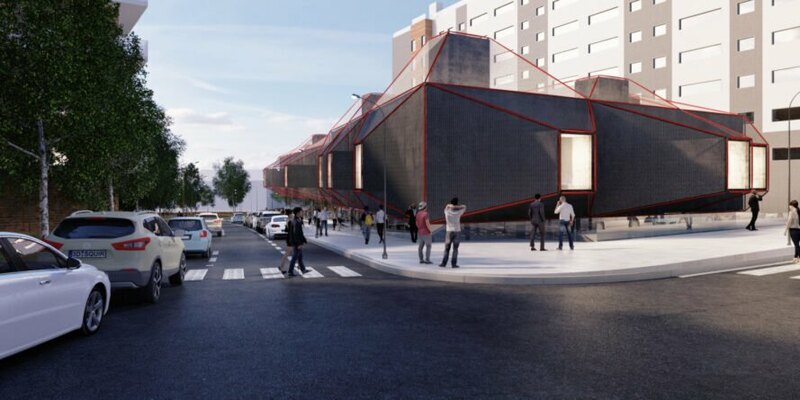 3GATTI Architecture Studio has unveiled a spectacular design for a new public library in Madrid. 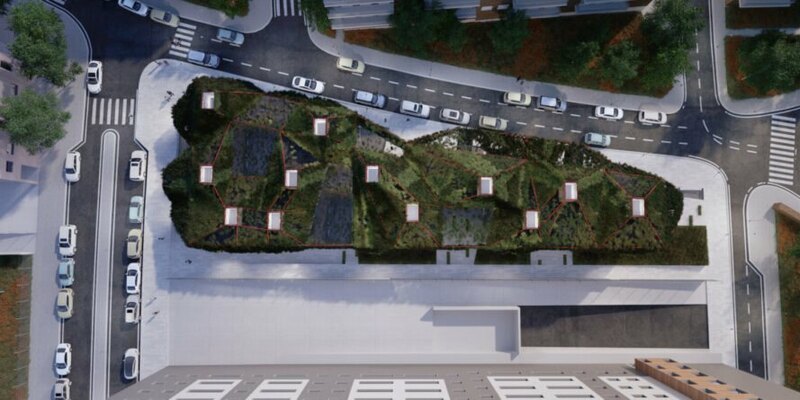 The firm envisions an eye-catching “green spaceship” for the public space; it is a building almost entirely clad in lush Virginia creeper vines. As well as creating an attractive landmark for the community, the building’s expansive greenery will act as a passive feature that will help to insulate the structure in winter and cool the interior spaces in the hot summer months. 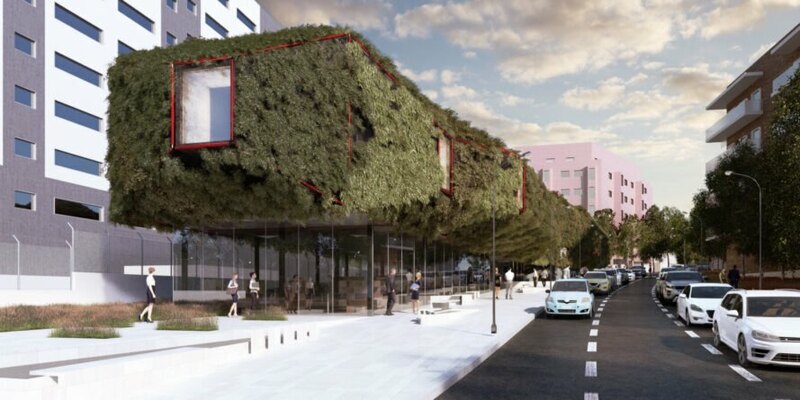 The international firm has proposed landing the green spaceship in the Villaverde district in southern Madrid. According to the architects, the library’s unique design was inspired by the desire to create a recognizable landmark in the community, a vibrant public space that will attract local visitors and forge a strong bond between residents and the neighborhood. The base of the two-story building will be comprised of a simple concrete and brick construction clad in a dark plaster. The first floor of the building will be completely transparent with floor-to-ceiling glass facades. This bottom floor will house the public areas, which will contain the ‘noisy’ functions. On the top floor will be the quiet zones, where visitors will be able to study and read. From the outside, this level will be completely covered in Virginia creeper vines planted on the roof of the building. 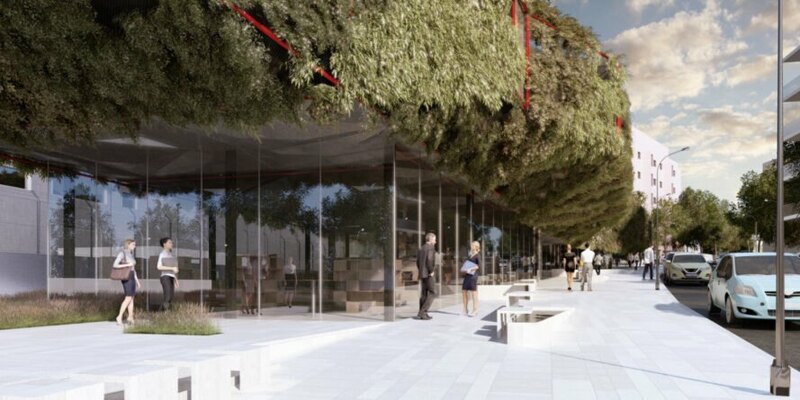 Contained with red tubes and metallic netting, the lush greenery will look like it is floating above the street, giving the library a surreal, spaceship vibe. However, in addition to being eye-catching, the concept is also very practical and optimized for the city’s climate. Green walls and rooftops always add an extra level of insulation. In this case, the vines will help cool the interior spaces during the hot summer months by shading them from direct sunlight. Adding to the building’s abundance of green spaces, the structure will house several courtyard spaces that let in air and light into the interior spaces. At the eastern side of the building will be enough space to plant an urban vegetable garden. Attached to the youth library rooms, these gardens will be used to teach children about the benefits of healthy living. Through the community gardens, workshops and various activities, the library will have a strong connection to the neighborhood. 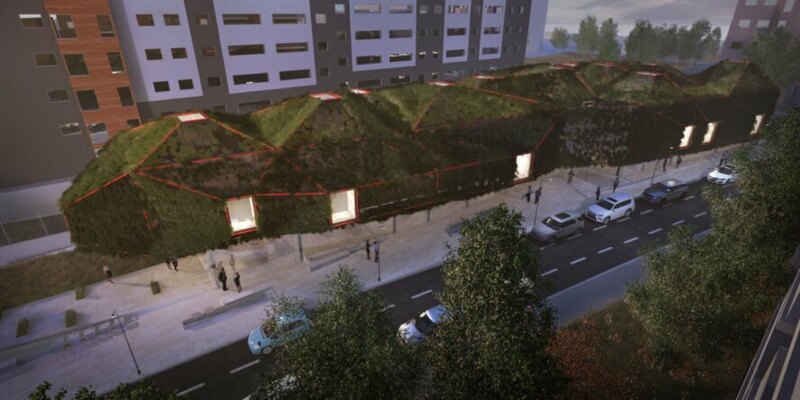 The Green Spaceship is a concept for a public library in Madrid by 3GATTI. The inspiration is to create a public space that attracts people inside. The building will be divided into two parts: the bottom floor, which opens to the public with a glass facade, and the upper floor, which will contain the study areas. The top floor is imagined as the real ‘spaceship’ with red tubes and metallic net cladding. During the hot summer months, the green facade will protect the building from the heat. The library will also have space for an urban garden.